In a previous blog post, I shared the five phonetic skills--strategies for determining if a vowel is long or short in a single-syllable word. What about multi-syllabic words? Where do you split the syllable in multi-syllabic words? Here are two simple decoding skills that you can use to teach students where to break syllables. 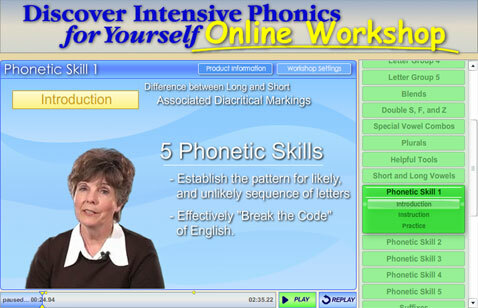 Then apply the five phonetic skills to determine if the vowel is long or short in each syllable. Using the two decoding skills and five phonetic skills in combination can help students with proper pronunciation of multi-syllabic words. Decoding Skill 2: If there are two consonants immediately following the vowel, divide between the two consonants. The first consonant will stay in the first syllable, and the second consonant will move on to the next syllable. For more detailed information, visit this link and the Online Workshop. Information adapted from the Reading Horizons program. Used with permission. Click here to read about the pronunciation of -ed. Click here to read about pronouncing plurals. Click here to read about voiced and voiceless sounds. Click here to read about rising and falling intonation in questions. Click here to read about syllable stress and the schwa. Click here to read about adding the suffixes -ing, -ed, -er, and -est. Click here to read about teaching common suffixes. Click here to read about teaching common prefixes. Click here to read about spelling words that end in S, F, and Z. This blog shares information about the lessons I've learned (and continue to learn) from my experiences traveling the world while creating curriculum, conducting teacher training, and teaching literacy and English to Speakers of Other Languages. Currently, I am the Curriculum Director and ESL Director at Reading Horizons in Salt Lake City, Utah (www.readinghorizons.com). Bottom-Up and Top-Down Strategies (or Processing): What Are They Anyway? What's the Difference: ESL, EFL, ESOL, ELL, and ESP? Decoding Strategies for ESL Students: Is the Vowel Long or Short? What Language Should ELLs Speak at Home?